I first began doubting that the Communist Party of India-Marxist might be secretively harbouring an inexplicable death wish, while sitting on the party podium along with the cr me le cr me of the state and central leadership on a sultry humid afternoon two years ago on the sprawling sea-beach grounds in Thiruvananthapuram. 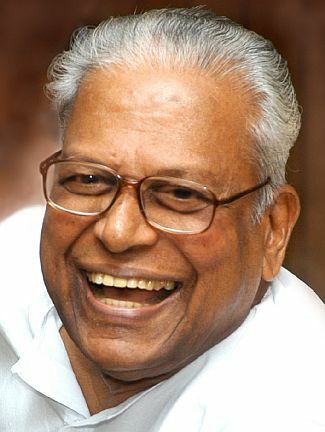 Chief Minister V S Achuthanandan, who was a listed speaker at that massive party rally, arrived late. I felt numbed with deep pain that his arrival was completely ignored by the party leadership. No one bothered to even greet him. He meekly took a chair. And he was the icon of my generation in Kerala, before I left home in 1973 to join the Indian Foreign Service as a career diplomat. But what struck me, equally, was the party cadres' enthusiasm when "VS" arrived, the sheer electricity in the air. I saw this dichotomy repeatedly during the party's campaign in the 2009 parliamentary election. True, Marxist ideology doesn't pay attention to personalities. Dialectical materialism is what matters. But then, through my long years living in communist countries as a diplomat, I also understood that this was a mere dogmatic pretence for outsiders' consumption. 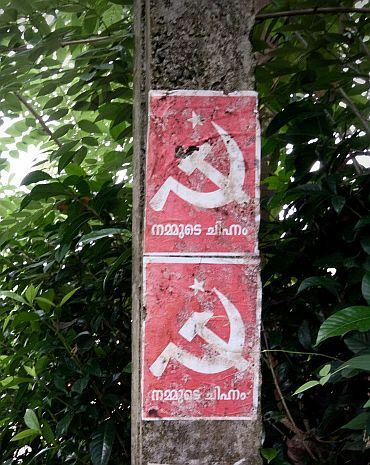 It is highly improbable that the CPM will honestly attribute the stunning performance of the communist-led Left Democratic Front in Kerala (winning almost 68 seats out of 140) -- making a mockery of Kerala's decades-long tryst with replacing an incumbent ruling party -- to VS's role as the torch-bearer of the entire campaign. Yet, the unvarnished truth is that this is VS's finest hour. 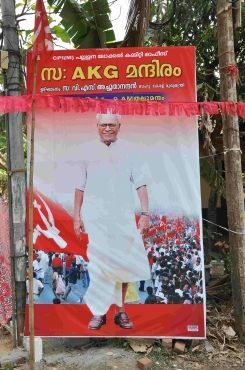 For the first time in the history of the communist movement in Kerala, VS's familiar face was beamed in posters in every nook and corner of the state appealing to voters to rally to the LDF. Yes, the very same VS who was derided openly by a top CPM leader as a "donkey" -- he, too, wanted VS to come and inaugurate the campaign in his constituency. (Which VS dutifully did.) Yes, the very same VS who was run down in a vicious special programme beamed by the party's television channel. Suddenly, everyone, all the LDF candidates, needed VS to make a campaign appearance in their constituencies. The rallies he addressed were jam-packed with people. I have seen this sort of popular enthusiasm a long time ago when after being hounded out of power unconstitutionally by the central government in 1959 and after being in the wilderness, the communist party stormed back to power in 1967. I was an undergraduate student in Thiruvananthapuram when on a rain-swept evening, we marched holding red flags in victory procession. It took one hour for the procession to cross a point. The LDF seems to be winning 68 seats and the United Democratic Front 72 seats out of a total of 140 -- plus one or two seats this way or that when the final tally comes. This is a tight slap on the face of "Amul baby" Rahul Gandhi by the people of Kerala for questioning their political wisdom in electing 87-year-old VS again. Incidentally, VS won by a thumping majority in Malampuzha constituency in Palakkad district. Quite clearly, the Congress seems to have anticipated this sort of a setback was not improbable and, therefore, toward the end of the campaign in April, they let loose a savage personal attack on VS and his family members, in which even stalwarts of the Congress with dignity and decorum like A K Antony stopped to participate. However, a great tragedy of this particular election in Kerala is that communal politics has resurfaced with a vengeance. The Congress-led UDF unabashedly pandered to communal politics and there has been a Christian and Muslim consolidation in its favour. Thanks to the Congress's allies -- the Church-backed Kerala Congress and the Muslim League -- it managed to secure a wafer-thin lead over the LDF. There is no other way to put in perspective the Muslim League's massive victory in Malappuram district and the UDF's success in Kottayam and Idukki districts. The Congress has done a colossal damage to Kerala's politics by reviving the almost-same rabidly communal, reactionary and casteist platform that it erected in the late 1950s to unseat the first communist government which came to power in 1957. In contrast, the LDF's success goes to VS's credit and is a testimony to the performance of the LDF government. But for the bickerings within the CPM through these past 3-4 years, there could have been a far better projection of the track record of the government led by VS. This is the first time in living memory that a ruling party in Kerala didn't run into the so-called "anti-incumbency" factor. The LDF actually improved its performance in Alleppey, Kollam, Pathanamthitta and Kozhikode districts and held on to its citadel in Kannur and did fairly well in Thiruvananthapuram. 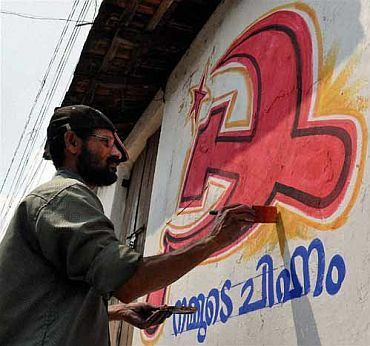 Within the LDF, the two communist parties have done exceedingly well. The Congress has, contrary to expectations, fared rather poorly. This comes as a big setback for the party. West Bengal is Mamata Banerjee's own cake; in Tamil Nadu, the myth that the alliance that contains the Congress will invariably be the winner stands exploded; it is only in Assam that Congress can claim victory. Does this speak of a party that is on an upward curve of "revival"? Hardly, so. It seems all this tamasha being enacted in Greater Noida is not going to work when the electoral chips are down. Is Rahul Gandhi responsible for the Congress's debacle in Kerala? Possibly, to an extent. He injected needlessly from his safe haven in Delhi a list of his own candidates to the KPCC (which was aghast at seeing the list), comprising faceless "Amul babies" who have no political base in Kerala. Congressmen are "chalu" people. And politics in Kerala is tougher than in most parts of India, as it is highly competitive and the elections are won and lost narrowly. The tough Congress leaders in Kerala know they don't vibe with Rahul Gandhi and they lack the charm of Omar Abdullah. But they know how to keep the GenNext out in the cold for a while. Besides, the scams in Delhi have discredited the Congress's image in Kerala. Malayalis, irrespective of party affiliation, usually show up to listen when national leaders come to address rallies. But not this time. Rahul Gandhi's meetings were poorly attended. Even astute Congress leaders felt that it was ominous. No doubt that Congress's image has taken a beating due to the scams. In comparison, the fact that there has been no "anti-incumbency" as such and that LDF retrieved such a huge ground it had lost in the 2009 parliamentary election shows that the secular-minded Malayali voters thought through carefully about the kind of government they should have. Conceivably, there has been a heavy consolidation of Ezhava and Dalit voters behind the CPM. 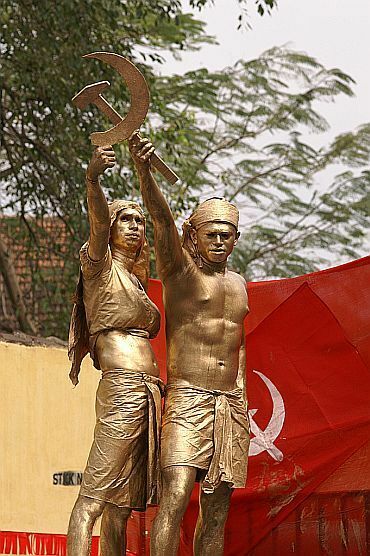 They have always been the backbone of the communist movement in Kerala. And the curious thing is that they have solidly identified with VS. This is a complex phenomenon that partly also explains VS's charisma. The painful reality is that the great social renaissance that began appearing towards the end of the 19th century and which eventually encompassed almost all sections of Kerala's society by the early decades of the 20th century has virtually dissipated. Sree Narayana Guru's social reform movement was multi-tiered; it had templates of revolt, resistance, justice, equality and fraternity and enlightenment and spirituality. His mission defied the caste hierarchy and sought to "liberate" the downtrodden from their obscurantist beliefs while exhorting that education held the key to progress and social advancement. Sree Narayana Guru understood that caste discrimination had an economic basis and the struggle against the obscurantist caste system was quintessentially the class struggle in Kerala. Without doubt, his "cultural revolution" provided the political backdrop for the subsequent rise of the communist movement in Kerala in the 1950s. However, as the communists under their middle class leadership took to bourgeois democracy in a big way in the late 1960s, a contestation began for political space with the Congress. This was waged through the 1970s and 1980s until it found an uneasy equilibrium in the emergence of two systems of alliances in the nature of two "united fronts" arrayed against each other. The result has been the politics of compromise and the sharing of power within and through coalitions that Kerala has been witnessing in the recent decade or two. Neither the UDF nor the communist-led LDF feels the urge to project the agenda of social reforms anymore. This was only to be expected since the political compromise essentially preserves and perpetuates the interests of the very middle class that had its origin in the old caste system. The basis of this compromise is power-sharing. And this compromise has enabled the swift return of the upper caste dominance. This compromise is also at the root of the social exclusion that women, Dalits, adivasis, etc face today in Kerala. Leave alone fighting caste oppression, political parties have no interest in waging struggle against corruption or atrocities against women and such other social ills that have reappeared. To cut a long story short, the political compromise also led to an unintended finale to the much-touted land reforms, which in the event failed to trigger the social revolution that it heralded. An impasse prevails today also over another reform area that aroused much hope and expectations when the first communist government was formed in 1957 -- education. By the beginning of the 21st century, the Kerala society had begun forfeiting one by one most of the gains of the social and cultural renaissance. 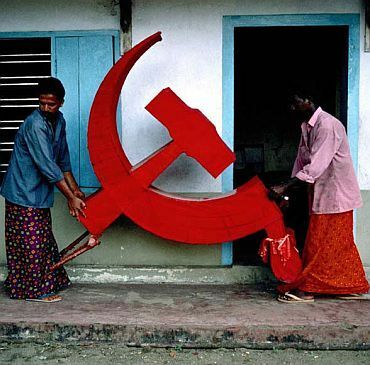 The Communists are to be primarily blamed for the state of affairs since they were the biggest beneficiaries of the progressive politics that the renaissance opened up in Kerala and their cadres were (and continue to be) predominantly drawn from the lower classes. Thus, the politics of VS needs to be assessed against a complex backdrop. Prima facie, it baffles an outsider how this 87-year old veteran communist leader continues to strike a chord among the cadres of the Left parties and the lower classes in general. The heart of the matter is that VS's politics is viewed by the common people as the antithesis of the politics of compromise. The tallest communist leader is not a member of the politburo! Ironically, this is also VS's predicament. At the end of the day, political power has come to acquire its own logic, especially when power can be seized without the hardships of a revolution. Enormous avenues have opened up to pursue the politics of privilege and at various levels this is happening, ranging from elected representatives, trade unions and feeder organisations to even youth wings and student bodies. For all appearance, therefore, the "Party is growing", and there is neither any sense of crisis nor any need of rectification. But then, membership of party organisation is very often seen as passport to employment or as safety net rather than a matter of ideological commitment. The recent unprecedented exit of two top CPM leaders and their joining the Congress party within hours shows up that the ideological cohesion of the party at leadership level has become dramatically shaky. This is not the first time Communists got disillusioned with the party, but such crass "defection" to the Congress (or to Rupert Murdoch) was unheard of. What happens now? The CPM is the single largest party by far. In terms of established constitutional norms, it should be VS's turn to be called by the governor to form the next government. But it seems a problematic proposition for Congress to abdicate power although it won some 10 seats less than the CPM in a house of 140 and morally loses its claim to be the "ruling party". Again, the CPM may well prefer to sit in the opposition. At any rate, for the CPM leadership there is much to introspect. What would have been the result today if VS hadn't been forced to govern all through these past five years literally with one hand tied behind his back? The shocking reality is that VS is the tallest leader of the communist movement in India today and he is not even a member of his party's politburo. Quite clearly, VS may not be controlling the party machinery but the election results amply bear out that he lords over the people's affection and respect. There is something more to this. VS's "party line" stands vindicated today. What the VS "line" insists is that the primary obligation of the party is not merely toward electoral politics but toward the vast segments of dispossessed, marginalised, humiliated, impoverished people. Ironically, the election results have just shown that VS's "line" has great validity -- that it also makes sound electoral politics to retain ideology-based identity rather than resort to all sorts of politics of compromise and Faustian deals with the party's class enemies, communal elements and time-servers. Lal Salaam, VS!